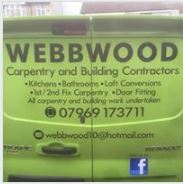 Webb Wood - Carpenter based in Grays, Essex. Hi, I’m Luke, a fully qualified carpenter with over 8 years of experience in the Building Industry and working in people’s homes. Webb Wood is a family run business, run by my dad for over 30 years but now run by myself and my best friend/work partner Tom. We pride ourselves in offering a prompt, efficient service and Are always conscious of our customer’s needs. We are also pleased to offer Free No Obligation Quotes. Take a look at our Work or why not visit my Facebook page.